I recently began H.W. 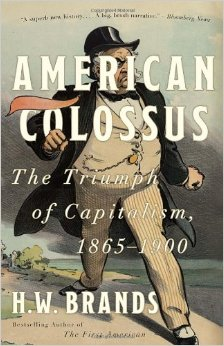 Brand’s book American Colossus: The Triumph of Capitalism 1865-1900. Last school year was my first formally teaching 11th grade US History and I quickly found that the Gilded Age and the rise of the industrialists was a weak point in my content arsenal. My goal in reading this book (as of this writing I am on page 33) is to strengthen my content knowledge of the era to be a more confident, competent teacher in the fall. As I opened the book and began reading the prologue, Brands hit me with an interpretation of the era that I found to be very thought provoking; and energized me at the prospect of leading my students through a discussion based on his words. On pages four and five of the book, Brands writes of the dual manifestoes of the American founding; Adam Smith’s The Wealth of Nations and the Declaration of Independence. Hopefully by the time students are juniors they are familiar with both of these documents (although this provides a wonderful opportunity to refresh their memories and engage in primary document analysis.) However, Brands goes on to write that these dual manifestos are also dueling manifestos. He explains his argument by writing that the Declaration, as the core doctrine of democratic government, spells out the importance of equality as the foundation of successful democracy. The Wealth of Nations, the gospel of capitalism, is alternately dependent upon inequality to function. The debate on morality of equality versus inequality in differing government and economic systems is far from innovative, but I believe provides an incredible opportunity to engage students during the introduction to the unit. This idea is admittedly in its infancy, but initially I anticipate engaging my students in critical discussion of Brand’s thesis. Do they agree that the principles of democracy and capitalism are inherently at odds with each other? Is there a moral obligation to address the inequality inherent in capitalism? If inequality is necessary for the capitalist system to thrive, should there be any attempt to address it? What are the potential dangers (if any) of the advocates of one side versus the other consolidating power for too long? After a discussion I would then formulate some type of writing assignment where the students would expand upon their views. In my experience this is how ideas evolve; they begin by taking some glimmer of insight from someone else and expanding upon it to make it their own. I will continue to tweak this concept from Brands in the hopes that it will engage my learners, and I invite you to do the same! Soon I will create an additional post based upon another aspect of Brand’s thesis: that this competition between the principles democracy and capitalism has resulted in a cycle of ascendancy that can be used to characterize the last 200 years of American history. Scott — I remember teaching this by taking a calculator and going around and asking kids how much money they had in the classroom that day. (I did have to tell them if they were carrying a lot of money not to announce that to the class and to just make some lesser amount up.) Then dividing the money by the number of students in the class, and then having a vote on who would like to divide the classroom total equally. I identified the ones who would have benefitted from the redistribution of wealth but didn’t support it and asked them why they didn’t want to do it and that started our discussion. I also used it to demonstrate the way money can influence elections. Loved that day.